We are selling “Cut in Stone” Engraved Pavers. 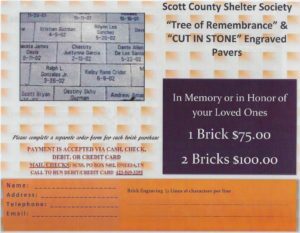 These pavers will be installed around the “Tree of Remembrance” at the Oneida City Park as a permanent display. The “Tree of Remembrance” is already in place at the park and the pavers will be installed, weather permitting, as soon as possible. The tree will be one of the lighted displays during “Christmas in the Park”. There are 200 pavers which match the 200 numbered leaves on the tree. There are only a little over 100 pavers till available! See the photo for more details or call the Shelter at 423-569-3355.